Water for elephants : a novel / Sara Gruen. Edition: 1st ed.Material type: Book; Format: print ; Literary form: Fiction Publisher: Chapel Hill, N.C. : Algonquin Books of Chapel Hill, 2006Online access: Publisher description Availability: Items available for loan: Butte Public Library [Call number: F GRU] (1). Checked out (1). Water for elephants / by Sara Gruen. Material type: Book; Literary form: Fiction Publisher: Waterville, Me. : Thorndike Press, 2006Availability: Items available for loan: Butte Public Library [Call number: LPB F GRU] (1). Riding lessons / Sara Gruen. Material type: Book; Format: print ; Literary form: Fiction Publisher: New York : Harper, 2007Availability: Items available for loan: Butte Public Library [Call number: F GRU] (1). Flying changes / Sara Gruen. Ape house : a novel / Sara Gruen. Edition: 1st ed.Material type: Book; Format: print ; Literary form: Fiction Publisher: New York : Spiegel & Grau, 2010Availability: Items available for loan: Butte Public Library [Call number: F GRU] (1). Water for elephants [sound recording] : [a novel] / Sara Gruen. by Gruen, Sara | Ledoux, David | Jones, John Randolph. Material type: Sound; Literary form: fiction Publisher: Minneapolis, MN : Prince Frederick, MD : HighBridge ; Audio Adventures/Landmark Audiobooks, pc2006Availability: No items available Checked out (1). Ape house [electronic resource] : a novel / Sara Gruen. Water for elephants [electronic resource] : a novel / Sara Gruen. Water for elephants [electronic resource] : [a novel] / Sara Gruen. Riding lessons [electronic resource] : a novel / Sara Gruen. by Gruen, Sara | Reed, Maggi-Meg | HighBridge Audio (Firm). by Gruen, Sara | Boehmer, Paul [nrt] | OverDrive, Inc. Flying changes [electronic resource] : [a novel] / Sara Gruen. Flying changes [electronic resource] / Sara Gruen. by Gruen, Sara | Gaffney, Catherine [nrt]. 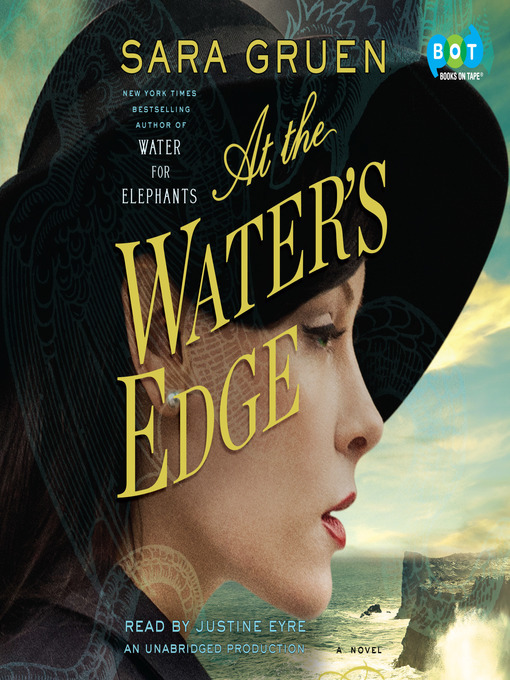 At the water's edge : a novel / Sara Gruen. Edition: First Edition.Material type: Book; Format: print ; Literary form: Fiction Publisher: New York : Spiegel & Grau, Copyright date: �2015Availability: Items available for loan: Butte Public Library [Call number: F GRU] (1). by Gruen, Sara | Eyre, Justine.